These lightweight shears offer high quality at a reasonable price. 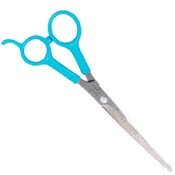 These shears are used by many professional groomers around the country & are particularly nice and safe for use around eyes and ears. The blades are Ice-Tempered for durability. Measuring 6 1/2" long and featuring a lightweight design with vinyl-coated finger holds and rest.